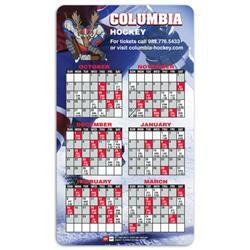 Custom Large 4x7 Magnet by Adco Marketing with round corners is a perfect trade show or office giveaway! Free Four-Color Process! FREE SETUP! Bottom Imprint Area: 4" x 0.4"
Holds a full color imprint. Must Specify "Stock Calendar Art"